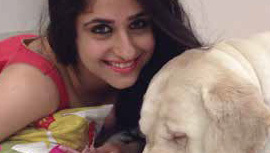 A dog’s skin is an indication of her overall health and hence forms a basic criterion while adopting a puppy. Here are a few common skin disorders our pets can suffer from. primary or on the basis of acute, self-limiting to chronic or long lasting problems which require long lasting treatment. 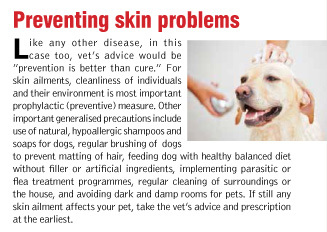 Generalised symptoms of skin infections include scratching, licking or chewing of skin, scabs, redness or inflammation, hot spots (one particular area where itching is intense), round scaly patches on the face and paws, dry flaky or otherwise irritated skin, rashes, lesions, drainage of bloods or pus, swelling, lumps or skin discoloration and rubbing face against furniture, etc. Allergic reactions may result due to various allergens. Eczema may be defined as an inflammatory reaction of the epidermis to certain exogenous of endogenous substances against which the cells are sensitised. Causes: Chemicals or drugs like antibiotics and Sulphonamides, animal products like milk, meat of different animals and poultry, eggs, wheat corn or soy, flea bite, distemper virus and worms like ascarids, hook worm, tape worm, whip worm may sensitise the skin causing allergy (worm allergy). It can also be caused by pollen of several flowers, chlorinated water, soap solution, etc. Symptoms: It includes itching, redness of the affected area and swelling either as diffused oedema or localised oedema of the superficial layer of the skin. Dry moist eczematous (an inflammatory condition of the skin attended with itching and the exudation) reactions. In chronic cases, lesions may become dry, thick, accompanied with constant itching and redness. In most cases, there may be exudation of serum and pus. Treatment: Your vet may prescribe Phenargan, Betnosole or Zincovit syrup. Consult your vet for dosage and treatment. Canine atopic dermatitis is an important hereditary (being passed from one generation to another) and chronic (an ailment persisting since a long time). It usually starts between 6 months and 3 years of age with some breeds of dog such as Golden Retriever starting at an earlier age. Symptoms: Dogs with CAD are itchy, especially around the eyes, muzzle, ears and feet. Some of the allergens associated with CAD include pollens of tree, grasses and weeds as well as house dust mite. Flea allergy is commonly associated with CAD. Treatment: Treatment includes avoidance of the offending allergens if possible, but for most dogs this is not practical or effective. Other treatments include antihistamines, steroids, cyclosporine and immunotherapy (a process in which allergens are injected to try to induce tolerance). Shampoos and medicated wipes might be used to prevent the severity of infection. Deficiency or overactivity of immune response might also be responsible for skin diseases. Insufficient immune response is associated with secondary skin diseases like increased susceptibility to demodectic mange and recurrent skin infections such as Malassezia infection or bacterial infections. Pemphigus foliaceus is the most common autoimmune disease of dog. Other autoimmune diseases include bullous pemphigoid and epidermolysis bullosa acquisita etc. Symptoms: It includes blisters in the epidermis, which rapidly break to form crusts and erosions, most often affecting the face and ears initially, but in some cases spreading to the whole body. Marked hyperkeratosis (thickening of pads with scale) might be evident in paw pads. Treatment: Azathropine and other drugs can be used as immunosuppressive agent. Keeping away the allergens and regular cleaning with shampoo as they need more of prophylactic treatment rather curative, is recommended. Fungal in origin, it should be treated immediately to avoid transmission of the infection to other pets and people in the house. The dermatophytes have affinity for keratinised tissues, e.g. skin, hair and nails and hence they produce cutaneous reactions known as ringworm infection. Causes: Microsporum canis, Microsporum gypseum and Trichophyton mentagrophytes, etc. Symptoms: It includes inflammation, scaly patches and hair loss. The fungus generally affects the upper layer of skin. There may be little apparent/visible lesions, which may show alopecia (loss of hair), scaly or crusted appearance. Lesions are circular (ring like) and may be 1-4 mm in diameter. Periphery of the lesion is raised and the central part is depressed like a thallus. Erythematous (reddish) patches along with stub of hairs can be seen within the lesion. Treatment: Your vet may prescribe Grisovin/Grisofulfin (Glaxo), Idofulvin ointment, Leucos (Water and ether extract of leucos aspara) and Tincture iodine application. Consult your vet for proper treatment. It is a clinical condition which results in due to pus forming (pyogenic) bacterial infection of the skin. This is accumulation of pus within the skin. Causes: Streptococcus, Staphylococcus, E.Coli, Pseudomonas and proteus are the common bacterial invaders. Symptoms: The lesions vary according to nature and distribution of infection. Exudation (discharge from the lesion) of pus and serum can be seen. Formation of micro abscess which may create large pus filled cavities and sinuses are also visible. Ulceration is not uncommon. Alopecia, Erythema and scales are formed. Interdigital pyoderma is very much painful and may affect the walking. Treatment: Cleaning of pyoderma (containing pus) lesion with topical antiseptic preparations like bovispray. Removal of dead tissue to facilitate drainage of pus and accumulating blood is also recommended. A lot many of ectoparasites (parasite living outside the body) are responsible for skin problems in canines. Of these, most common are Sarcoptes scabies, Demodex canis, Rhipiciphalus sanguineus, Dermacanter andersoni and Ctenocephalus canis (Dog Flea), etc. They also have varying but similar symptoms. Treatments vary according to causative agents.